Katy Perry told you “you’re a firework,” now it’s time everyone else knows it too. 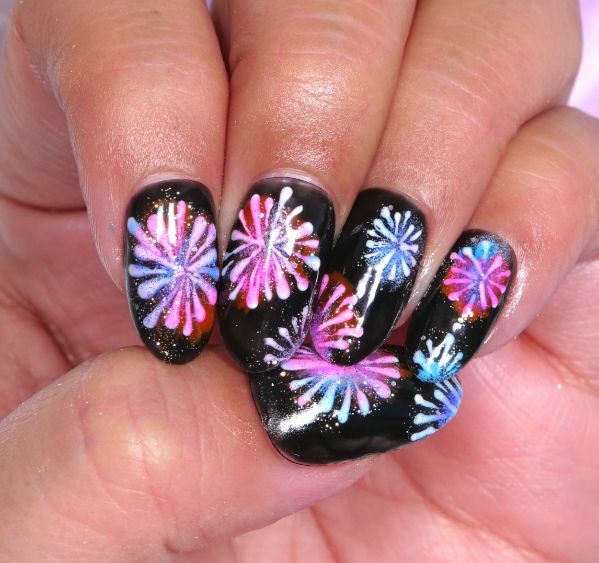 Display your worth all over your fingertips with this dazzling firework-inspired nail design. Follow the video below to learn how to recreate the look. Better yet, share it with your girlfriends, so you can all rock the same design at your next shindig. To paint this cool mani, you’ll need red and blue polishes, and a few nail tools for precision purposes. You definitely don’t want to use the wrong tools when giving yourself a manicure. See the tutorial for tips on how to create your desired effect in an easy, efficient way. 1. Add at least two coats of a black gel nail polish onto your nails. 2. Create small stripes that form the shape of fireworks on each nail with the white gel polish and dotting tool. 3. Dab the sponge brush on top of each firework shape to create a slightly blurred effect. 4. Apply the red gel polish on a portion of each firework shape. Replicate this step on each of your nails. 5. Repeat step four using the blue gel polish on the remaining parts of the firework shapes. 6. Add the clear gel top coat to seal in the designs.